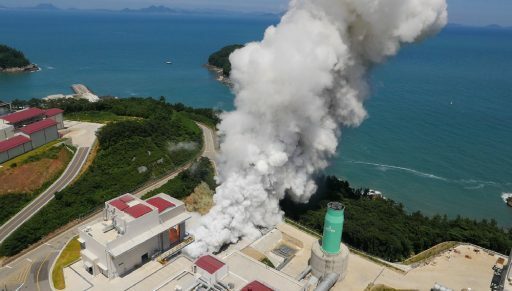 South Korea is proceeding with testing of the country’s most advanced rocket engines for use on the KSLV-2 carrier rocket that is hoped to end South Korea’s reliance on foreign launch vehicles for Low Earth Orbit missions, also opening a door to the commercial launch market in Asia. South Korea celebrated its first successful sub-orbital launch in January 2013 when the Naro-1 small satellite launch vehicle – developed with Russian assistance – delivered the STSAT-2C into orbit in its third flight after encountering a pair of failures in 2009 and 2010. Following the first successful orbital mission, South Korea set its goals on the development of indigenous launch vehicles that could deliver satellites and support robotic exploration of the Moon in the 2020s. The first step in this ambitious endeavor is the KSLV-2 launch vehicle – a three-stage rocket capable of lifting 1,500-Kilogram Earth Observation Satellites into orbit. The 47.5-meter tall KSLV-2 is currently on a schedule for a sub-orbital test flight in December 2017 and visible progress has been made on the flight hardware. 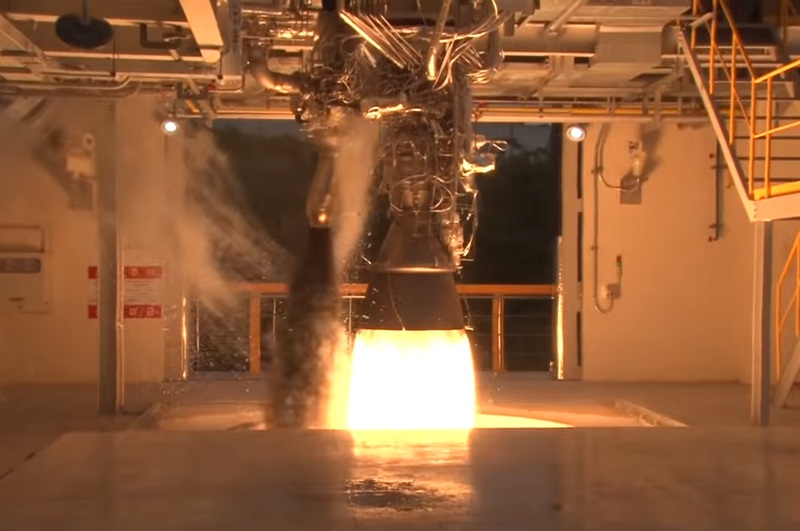 Videos posted to the YouTube page of the Korea Aerospace Research Institute this week show full-duration firings of the country’s seven-ton upper stage engine, following up on full-duration tests of a 75-metric-ton-force engine earlier this year to be used on KSLV’s lower stages. KSLV-2 will utilize four engines on its 3.3-meter diameter first stage for a total thrust of 300 metric-ton force. The engines consume Rocket Propellant 1 fuel and Liquid Oxygen oxidizer, employing an open-cycle scheme with a high-pressure pre-burner generating hot gas to drive the turbines and then expelling it through an exhaust. KARI noted that the engine design uses SpaceX’s Merlin 1 as a role model in terms of the margins in its construction allowing for thrust to be increased in a future iteration and ultimately permitting re-use of the engine. In the version used on the first stage of KSLV-2, the engine delivers 655kN of sea level thrust at a specific impulse of 298 seconds. The second stage of the vehicle makes use of a similar engine, the only change being the addition of an extended nozzle to optimize the engine for operation in the upper atmosphere, achieving a 325-second impulse. KARI went through component testing of the 75-ton engine in 2015 and the first complete power unit was installed on a newly assembled test stand in April of this year for short-duration testing. Initial burp tests verified the clean start-up on the engine before graduating to longer tests. Gradually increasing to firings of several seconds, engineers found combustion instability to be a significant issue – a well known teething issue new engines can suffer from. Continuing to refine the propellant injectors, KARI continued with 75-second test firings in a program that foresees around 200 engine tests ahead of the first launch of the KSLV-2 rocket. 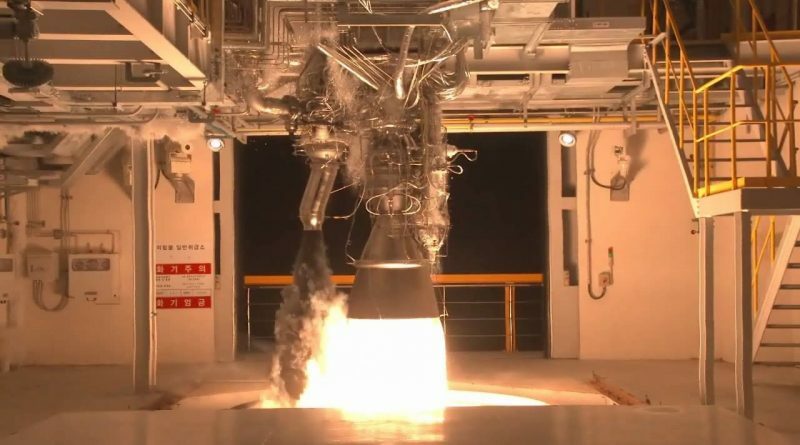 The first full-duration test firing of the large engine was completed on July 20 for a total of 145 seconds in a highly instrumented setup that confirmed combustion instability had been overcome. All test firings since April used the same engine unit, confirming its durability with a total burn time in excess of 400 seconds. When flying on the first stage of KSLV-2, the engine will have to operate for 127 seconds while the second stage power unit has a longer burn time of 143 seconds. KARI planned to put an improved test unit with special focus on stable combustion on the test stand in October. 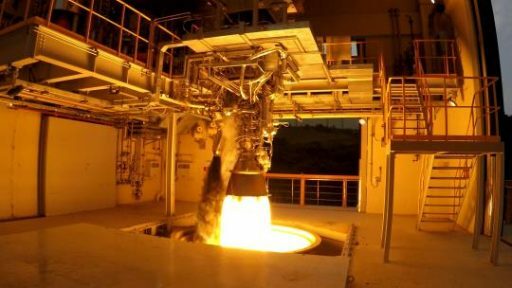 A total of 17 development and certification test units are planned to be tested as part of the 200-test program, also aiming to operate engine right at the edge of their design environments. The third stage of the KSLV-2 launcher will use a 7-metric ton-force engine, also using the RP-1/LOX propellant combination and achieving a vacuum impulse of 325 seconds. Gas generator tests for the upper stage engine started back in 2014 leading up to initial short-duration ignition tests in 2015. This week’s test marked the first full-duration firing of the upper stage engine for 580 seconds compared to a total of 502 seconds the engine will be required to function in flight. 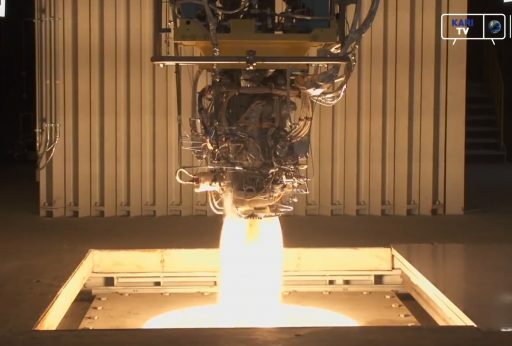 The test was dedicated to verifying combustion stability, mechanical durability, and performance parameters of the engine, starting out a development and certification testing program with at least 160 trials. The current KSLV-2 development phase will culminate in late 2017 or early 2018 with a test flight of the launch vehicle, dedicated to the verification of the 75-ton engine performance in flight – likely featuring a dummy upper stage. The three-stage version of the rocket will finish development in 2018/19 ahead of a pair of test launches. 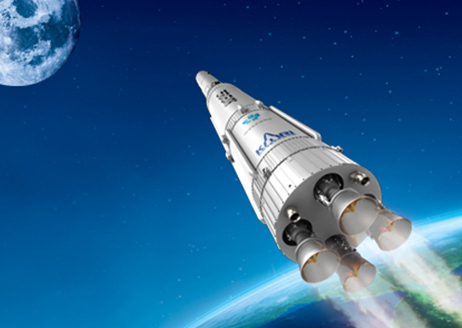 Once declared operational in the early 2020s, KSLV-2 is hoped to establish a very good reliability record to find its niche in the commercial launch market, specifically the launch of LEO payloads up to 2,600 Kilograms at affordable prices. For South Korea’s space aspirations, KSLV-2 will act as stepping stone – capable of launching KOMPSAT Earth Observation and Reconnaissance satellites, but falling well short of the performance needed for the launch of heavy satellites and sizeable lunar landers. South Korea finds itself in the middle of a race against the secluded North where, just recently, a new 80-ton engine completed its first test for use on a large rocket capable of matching or even surpassing KSLV’s capabilities.